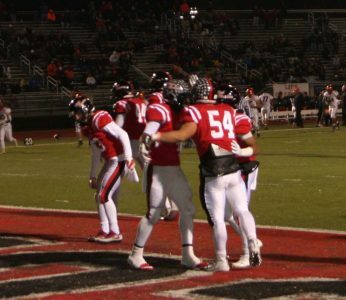 Coatesville players celebrate a score during Friday night’s dismantling of Pennsbury in the District One, 6A semifinals. CALN — If you had any doubt that the 2017 Coatesville football team is for real, Friday night’s easy dispatch of one of Southeast Pennsylvania’s top programs should erase them entirely. The Red Raiders (12-1 — No. 4 seed in the 6A, District One bracket) dominated Pennsbury from start to finish, 42-2, setting up a sectional final at third seeded Garnet Valley (12-1) this Friday night. At the end of that day, the Falcons (10-3) could not keep up with the speed of Coatesville led by quarterback Ricky Ortega and star running back Aaron Young. Ortega, who put up monstrous numbers led the Red Raiders to victory. Two touchdown runs on his own with two passing touchdowns and over 200 all purpose yards. Young also helped add to the point tally with a momentum swinging interception return. The 90 yard run resulted in a touchdown and put the Red Raiders up 35-0 right before the half. “Their quarterback is the real deal, whole package threat both on the ground and in the air” said coach Dan McShane about Coatesville quarterback Ricky Ortega. Ortega, who has led the offense throughout the season, acted no different this game when helping to put up 42 points. Pennsbury’s only 2 points came at the end of the fourth quarter when Coatesville took a knee in the end zone to avoid a punting situation. The winner of the Coatesville-Garnet Valley game will play the winner of the Parkland-St. Joseph’s Prep game in the PIAA 6A Eastern Championship. Coatesville won that title in 2012 but fell in the state championship game that season.